I was way down south-east in the suburbs of Southend. I'm not saying they are dull, but they are the kind of place one might use in a warning to ones teenaged children - "If you don't behave yourself, we're moving to the suburbs of Southend" or some such. However, I knew my first church would be open because it says so on their website, and in what might have seemed at first sight an unpromising area I visited fourteen churches, nine of which were open, and two others had a keyholder notice. So, first of all to Holy Trinity, Rayleigh. A sign in the lychgate said 'Church Open' and the outer doors were hooked back. This is a wide church on a busy road. 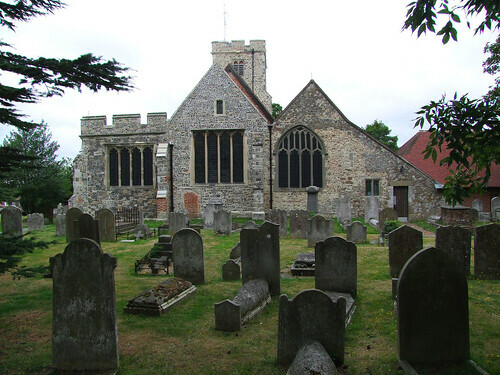 In the Essex fashion, the aisles go all the way up to the east end of the chancel, making the view from the east most attractive, the chancel and north aisle gables and the south aisle castellated, and especially lovely with the working windmill just beyond the west of the church. Stepping inside, the church was full of warm light, with hardly any coloured glass. The east end was substantially rebuilt, but the nave aisles and arcades are really good 14th Century work, including what might be the masons names lettered on the south arcade. The interior is pretty well all 20th century, but seemly and fitting for Anglican worship. There were three old people serving coffee in the corner, but they didn't interfere other than to say hello. There is a vast 1980s extension to the north, as big as the original church, and all in all it had the feel of a well-kept and busy town church. I liked it.